Real Madrid defender Pepe is yet to sign a contract extension with Real Madrid and the further delay of this act has sparked rumours of the player possibly eyeing a move to the fast growing Chinese Super League. According to MARCA, Pepe is almost certain to join the likes of Oscar, Hulk, Pelle and Tevez in China’s football league if he does not sign a contract extension with Zidane’s team soon enough. Pepe has spent a decade with Real Madrid and made contributions which both the fans and club will always be thankful for. However, that might not anymore be a factor to give him a contract extension, with Raphael Varane ready to be a starter week in and week out and doing so with promise and admiration. To add to Pepe’s woes, on loan defender Jesus Vallejo has completed some stellar performances with Frankfurt, proving he could be Madrid’s third backup CB for next season. However, with China yet to gain worldwide popularity for its soccer and the 2018 FIFA World Cup in the Portuguese’s mind, he is yet to make a firm decision whether to stay and fight or to move on and hope for the best. It is safe to say if Madrid come offering an extension, Pepe might not hesitate in putting pen to paper and committing to his current club. 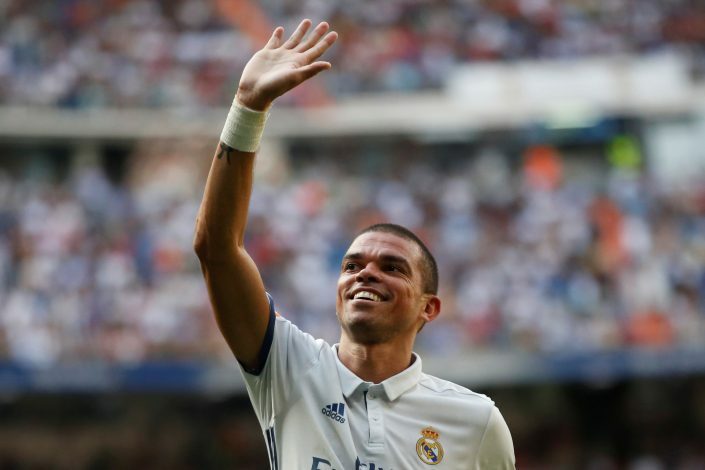 With age catching up as a factor and him turning 34 in February, Pepe has certainly entered the last phase of his professional career and every step now needs to be a careful one for him to get the goodbye he deserves and much dearly wants. The Portuguese defender will turn 34 next February, and has undoubtedly entered his decline.